– The Carlino Concept based SUV will be the first sub-four metre product from Hyundai. – Will rival the Maruti Suzuki Vitara Brezza, Ford EcoSport and Tata Nexon. – Has been spotted testing in India already. Hyundai is prepping a new compact SUV for the Indian car market which will be positioned below the high-selling Creta. The sub-4 metre SUV is internally called the QXI and will be a production version of the Carlino Concept showcased at the 2016 Auto Expo. According to recent reports, the QXI will be officially launched in India towards the end of the first quarter of 2019, perhaps by March. Speculated to be called the Styx, the QXI will rival the likes of Maruti Suzuki Vitara Brezza, Ford EcoSport and Tata Nexon in the sub-four-metre segment. 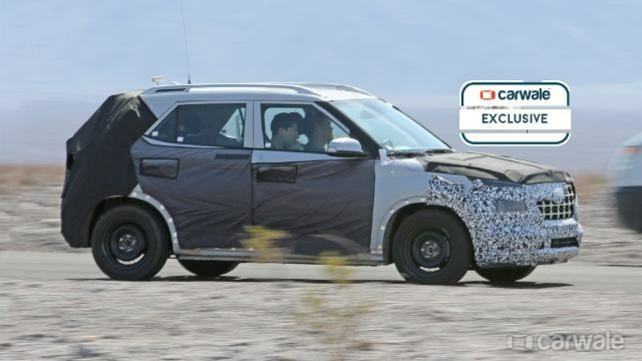 The test mule of the new SUV was spotted in the US in July, and more recently, a similar test mule was spied in India as well. Design wise, the QXI will have Hyundai’s characteristic cascading grille up-front which will be flanked by sleek headlights akin to the one seen on the new-gen Santa Fe. This two-tier headlamp unit will have a sleek unit on top with LED DRLs. The fog lamps will be positioned further down the bumper. Being a crossover, there will be body cladding all around the vehicle. The silhouette seems to be a scaled-down Creta; even the rear will have a similar tailgate. A new stylish alloy wheel design is also expected to be part of the package to go with the overall looks. Being a Hyundai, the cabin will have all the bells and whistles expected from its segment. There will be a touchscreen infotainment system dominating the dashboard and we expect to see Creta-like elements inside the cabin. Powering it might be the same powertrain as the Elite i20. So we expect a 1.2-litre petrol and 1.4-litre diesel under the hood. Transmission could be a five- or six-speed manual with the probability of an AMT as well which debuted in the Santro. The QXI will be one of the eight new products Hyundai India plans to launch in India by 2020. The list of new products also includes the new-gen Santa Fe, updated Elantra apart from the new generation of the Grand i10, Xcent, Elite i20, and the Creta. Meanwhile, Hyundai will also bring in the first Kona EV to India, which will be locally assembled at the carmaker’s Tamil Nadu facility. Pricing for the QXI is expected to start at around Rs 7-8 lakhs.